Fall is one of my favourite times to travel around Scotland. 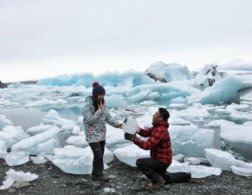 The offseason is the perfect time for a road trip – not only are there fewer tourists on the road and everything becomes more affordable, but the landscape also presents itself from its best side! Two of the best regions in Scotland to witness the fiery display of fall colours are Perthshire and the Cairngorms National Park. 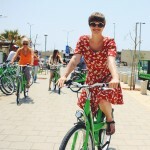 Here are a few things you should know about visiting. The two main towns in these areas are Pitlochry in Perthshire and Aviemore in the Cairngorms – both are brilliant home bases to explore more of the area and boast plenty of infrastructures like accommodation, shops and restaurants. From Edinburgh or Glasgow, it takes about 1.5 hours to drive to Pitlochry and just over an hour more to Aviemore. Perthshire and the Cairngorms are both well connected to the national rail system and there are train stations in Pitlochry and Aviemore as well as a few stops in between. There are local buses servicing some of the local towns in the area too. That said, it is best to rent a car and drive yourself, as many of the viewpoints and attractions in the regions are not accessible by public transport. Driving in Scotland can be daunting, especially if you are used to driving on the other side, or if you’re not used to winding mountain roads. The main roads to Pitlochry and Aviemore are wide and very easy to navigate, but some of the smaller roads here can be single-track (or close to it) and rather intimidating. If you’re a nervous driver, just remember to take it easy and don’t rush yourself. Here are some more of my driving tips for Scotland. You can either stay in the towns which has the benefit of restaurants and shops in walking distance, or retreat to a more isolated countryside experience – both has its appeals and gorgeous views are never far here! There are many AirBnBs in the area and on my most recent trip to Perthshire and the Cairngorms I stayed at Dell Farm B&B near Glenlivet. We received a warm welcome and I wish we could have stayed longer to explore the woodlands surrounding the B&B. In the past, I have also stayed at two different hostels run by Hostelling Scotland in Aviemore and in Pitlochry. Both are within easy reach of the town centres as well as the train stations, and offer mature but affordable accommodation in the area. 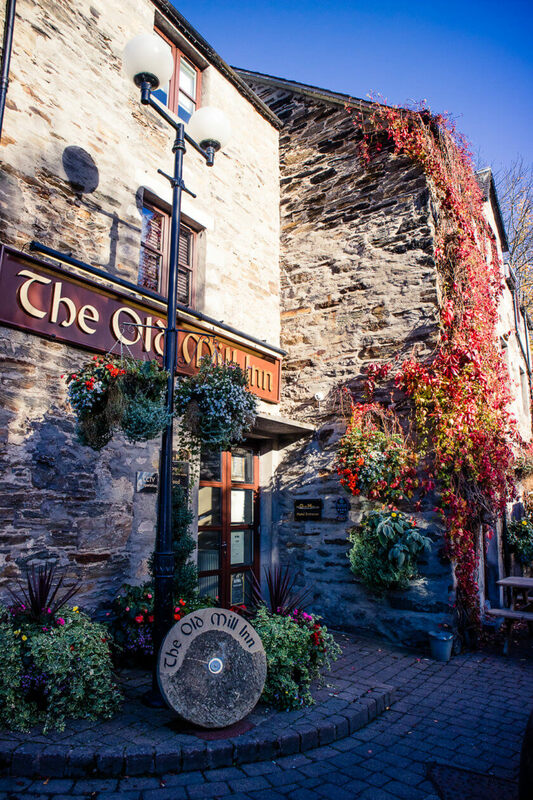 The picturesque town centre of Pitlochry is not only a welcome stop for a hearty meal or a warm cup of tea (for example at Hettie’s Tearoom which has great vegan options), it is also a great place to see the fall colors in autumn. 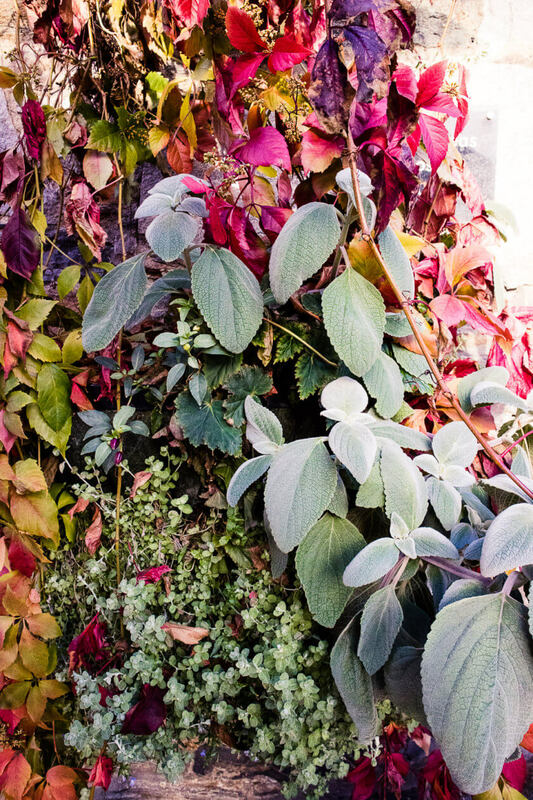 In the town, there are several buildings covered in ivy and wines, which change colours to a bright red. 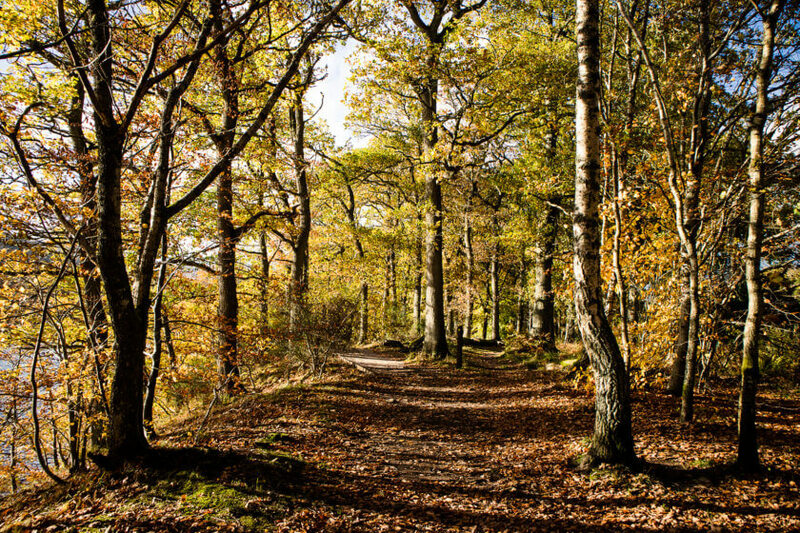 Pitlochry also lies right on the shore of the River Tummel which is covered in woodlands. When we visited in mid-October, the trees were shining in shaed of yellow and orange – it was beautiful! 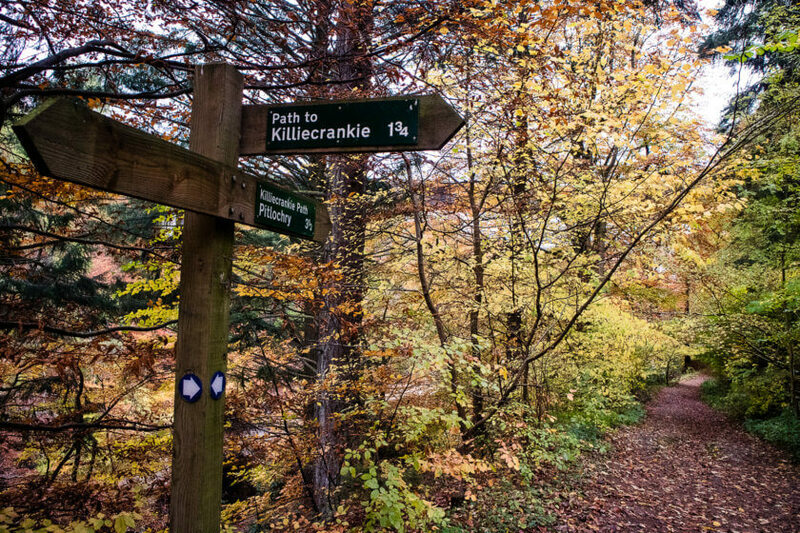 There is a woodlands path that runs along the river all the way to Killiecrankie – this circular route suggestion is about 9 miles and offers stunning views over the river and the trees. There are several carparks in Pitlochry – make sure you pay the parking fee before you leave the carpark and display the ticket in your windshield. Between Pitlochry and Killiecrankie there is a bridge over the River Garry which is famous for its’ beautiful views. 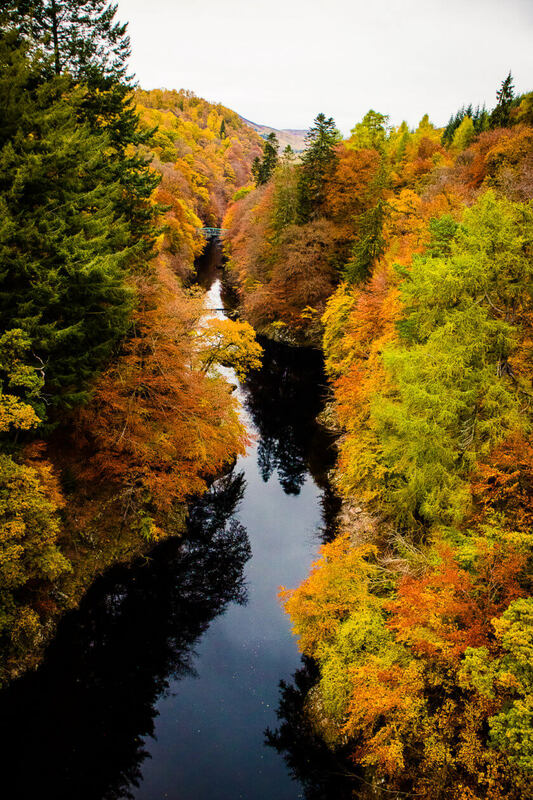 Not only does the river passing under the bridge look small and insignificant from the top, but the surrounding woodlands also show some of the most beautiful fall foliage in Perthshire. I highly recommend leaving your car behind at the free carpark just after the bridge and walk down towards the footbridge over the river to get a look back at the big bridge. 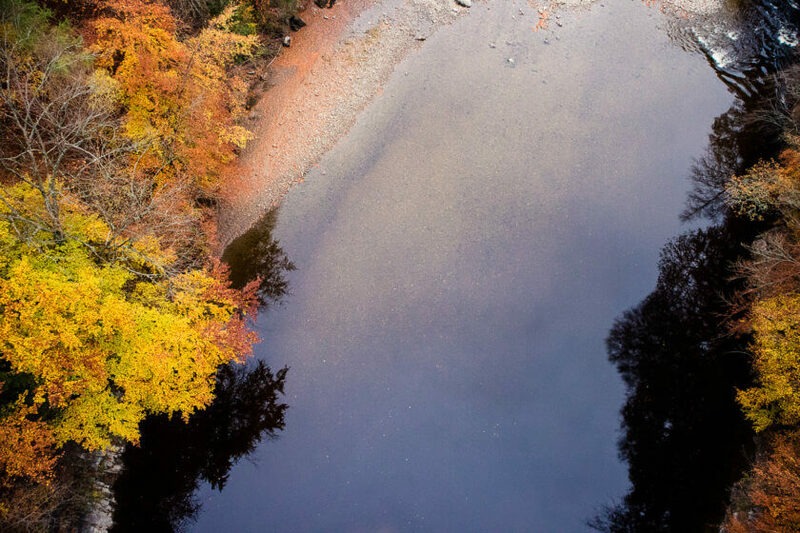 You might hear some screaming coming from the bridge, but don’t be alarmed – this is a popular bungee jumping spot in Scotland! This viewpoint is worth the slight detour up the narrow B8019 road. 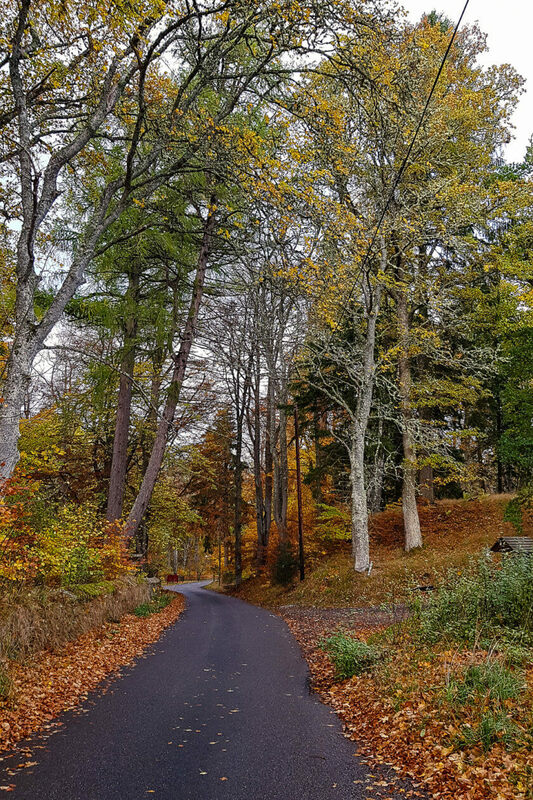 It is not a single-track road, but with the first fall leaves falling to the ground and obscuring the exact edge of the road, it can feel like one from time to time. Slowly the road climbs higher and higher until a sign suddenly points towards a carpark on the left. The Queen’s View was visited many moons ago by the British Emperor Queen Victoria I, who thought it was named after her. However, it is more likely that the viewpoint was named after Queen Isabella, King Rober the Bruce’s first wife. 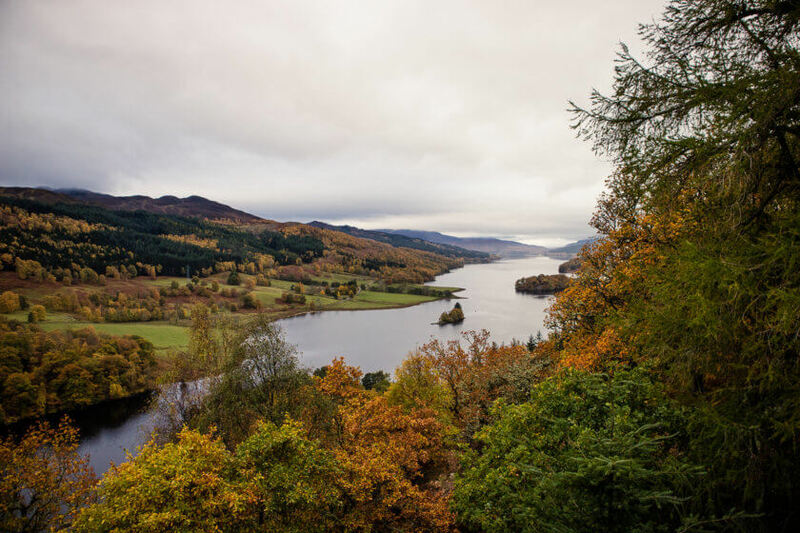 From the vantage point you get a great view over the woodlands of Perthshire, the water of Loch Tummel and if you’re lucky with clear skies, you can even see the summit of Glencoe in the far distance! The next stop on our road trip was Aviemore, the biggest town in the Cairngorms National Park, which is Scotland’s other mountain range after the Highlands. Technically, the Cairngorms are part of the Highlands, but when you talk of the Highlands, most people will think about the mountains on the west coast and the north of Scotland. The Cairngorms National Park covers mountains, valleys, lochs and rolling hills and has a high density of local wildlife, such as Scottish wildcats, the rare red squirrels and lots of forest animals, like hares, badgers and stags. Aviemore itself is a bustling little winter resort town – there are several ski resorts in the area and so the town caters particularly to outdoorsy tourists, but is also just a great home base for day trips in the area. 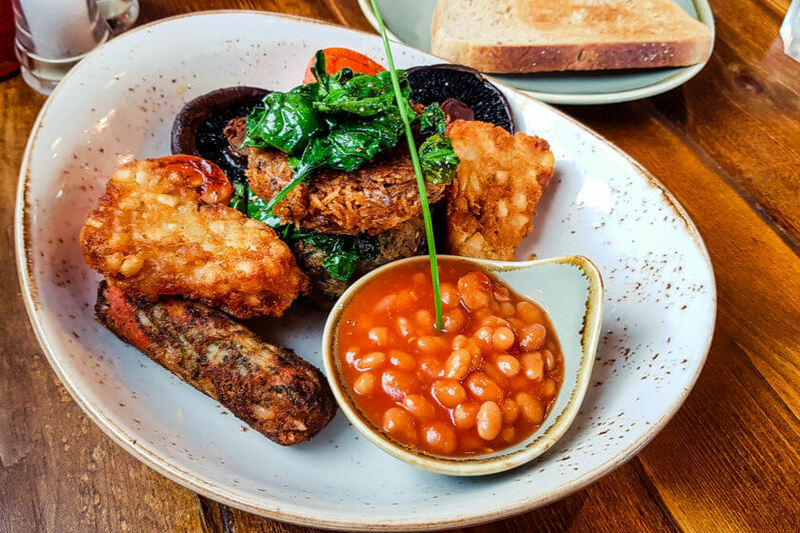 My favourite place in Aviemore is the Mountain Cafe from where you get a great view over the Cairngorms mountains in the distance – and they also serve amazing food! The most famous lake near Aviemore is without a doubt Loch Morlich – and it is certainly one of Scotland’s most beautiful! We headed to another nearby and lesser-known lake instead though – Loch an Eilein. 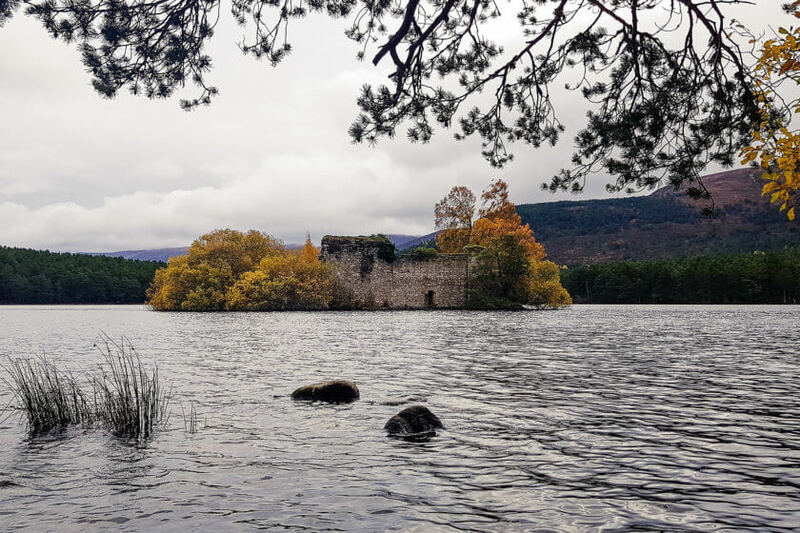 There is a castle ruin on a small island in the middle of the lake, which makes for a great photo op and the forest around the lake is dotted with yellow birch and larch trees, the last of the blooming heather and bright red mushrooms on the ground. It made for a lovely afternoon walk to see the fall colors and there were not many other people around! 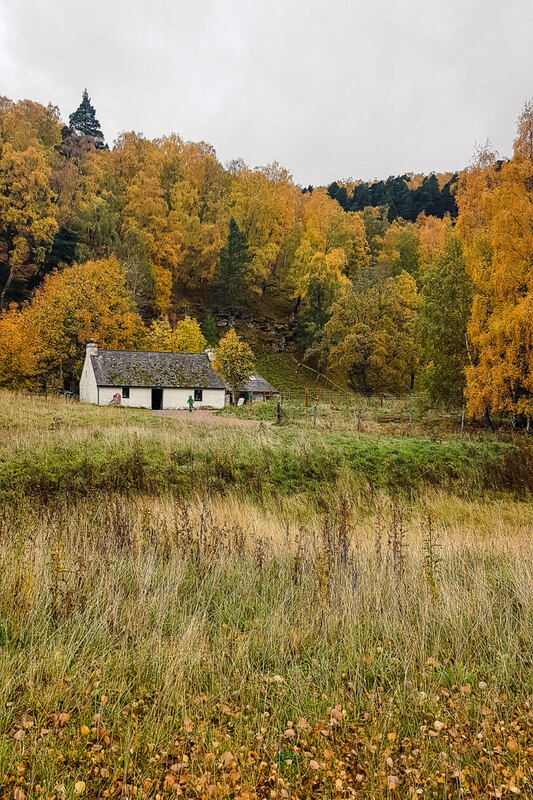 The Cairngorms National Park, in general, is a great destination for fall foliage and there is barely a road not worth taking to see some more examples of it. 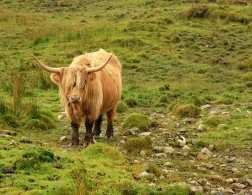 We drove around Nethy Bridge, Tomintoul and Glenlivet and stopped at places like the Abernethy Forest, the bridge at River Avon, the Highland cattle by Auchnarrow and for a forest walk near Tomnavoulin. Of course there are many other things to do in this area, other than spending time outside to see the fall foliage. There are tons of whisky distilleries in this area – two in Pitlochry, one in Blair Atholl and one in Dalwhinnie, and many more in the Speyside area which starts north of Aviemore and the Cairngorms, such as Tomintoul, Glenlivet or Ballindalloch. Near Pitlochry, you could visit Blair Castle & Gardens or get a ticket for the Enchanted Forest experience during the fall. Near Aviemore there is the Scottish Reindeer Centre, which is home to a herd of reindeer from Scandinavia, and a bit further down the valley, you can ride a funicular up the Cairngorm Mountain. 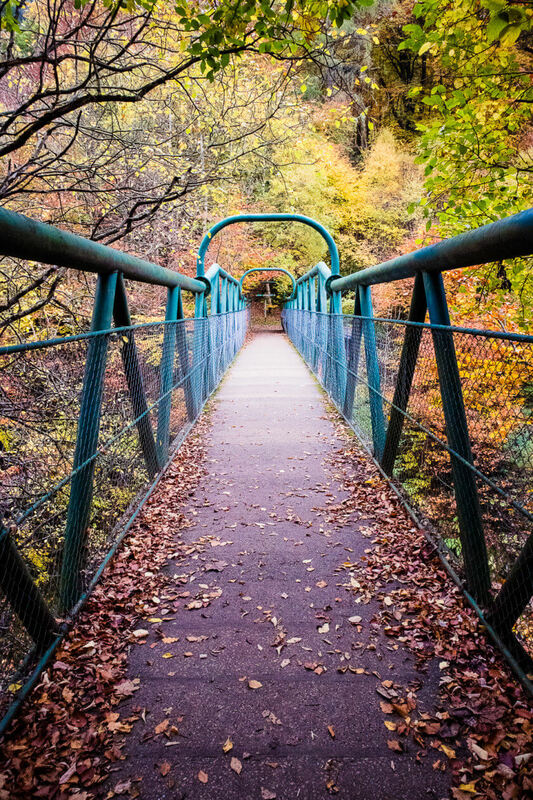 You could easily spend an entire week in Perthshire and the Cairngorms National Park to witness the fall colors in Scotland and experience a side of Scotland that is off the beaten track! I went to Scotland this summer but you're definitely, definitely making me want to go back and see so much more, and from a different light! 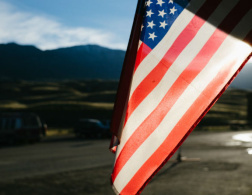 I love this country so so much !